Nursing shortages in the aged care sector are already at crisis point and the ongoing challenge of workplace injuries means it’s more important than ever to examine how new technology can help alleviate pressure on staff. The New Zealand Aged Care Association (NZACA) says record numbers of registered nurses are already leaving aged care homes for the public sector in anticipation of better pay and conditions following the recent agreement reached between DHBs and the nurses’ union. Adding fuel to the fire of the staffing shortage, is the fact that the aged care industry has an exceptionally high workplace injury rate. According to ACC, 40% of all claims made by workers in the health care sector now come from rest home workers. Over one third of those claims require more than 60 days off work – creating lost productivity, high turnover and increased ACC levies. In fact, the cost of having one employee away from work for a three month period is estimated to be $6,100 to an employer. Add to that the additional costs of having to find, train and fund temporary cover, and it’s a sizeable challenge. One of the leading causes of injuries is moving and handling. On average, carers are cumulatively lifting 1.8 tonnes of weight during an 8 hour shift. Deborah Harrison, a UK-based global manual handling expert, believes one solution is to embrace modern technology such as overhead lifting. Deborah, who is the founder of A1 Risk Solutions, says investing in this technology allows staff to implement ‘single handed care’ and frees up valuable time to focus on other aspects of caring for patients which are often rushed or neglected altogether. A wide variety of overhead lifting equipment is now available on the market to make single handed care possible, including overhead lifting solutions which can easily be incorporated into new build designs, or retrofitted. A reluctance to spend money on new equipment and the misrepresented notion that overhead lifting solutions aren’t visually appealing, are the most common barriers to change. “Education and training are required by facilities who make the transition, along with an effective strategy and good business plan. But the rewards are worth it.” Deborah says. Denmark introduced mandatory 2-1 caregiving practices in 2017 after a large study showed the clear benefits of overhead lifting systems. Most lifting and hygiene routines could be handled by one caregiver instead of two, freeing up 859 carers (FTE) and saving £37-98m in annual salaries. Sick leave due to lower back pain is also down by 73% in some Danish municipalities. Cubro is the exclusive supplier of Ergolet which provides a wide range of overhead lifting solutions. 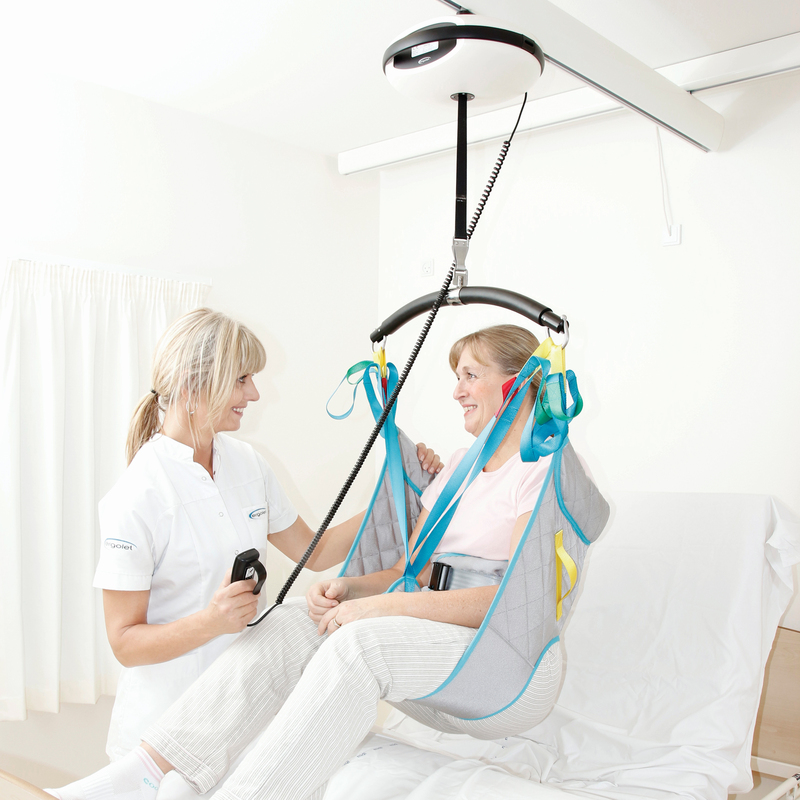 The elegant, high weight capacity Luna ceiling lift can glide smoothly along a variety of wall mounted or embedded systems, and can even transfer patients from room to room by negotiating doorways. Their discreet design mean they’re unobtrusive and look good also. The payback time for installing overhead lifting solutions in New Zealand is about three years (the time taken from the reduced injury cost savings to exceed the initial setup and staff training costs). So while significant investment may be required upfront, the return on that investment speaks for itself. And in the current staffing climate, creating a safer work environment will go a long way towards retaining and attracting carers.